Today is my parents wedding anniversary, so I thought I would post a 'perfect date' recipe. Do you guys get the pun? I am not so good with puns or writing introductions. Since the Ramadan Month is starting tomorrow, Amma suggested that I post a dates recipe. 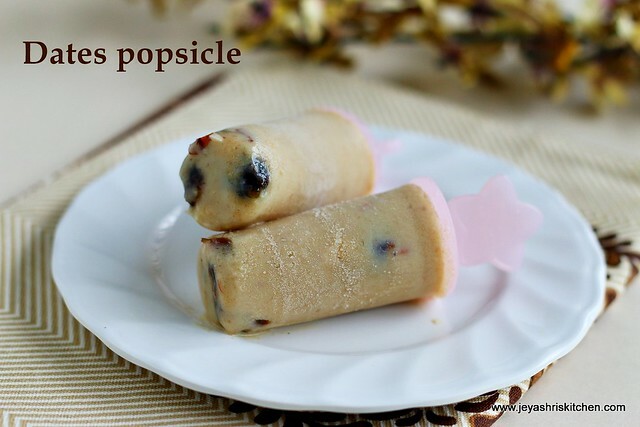 Nowadays it rains quite often but you don't need a sunny weather to eat popsicle, right? Well at least I don't think so. Popsicles can be eaten anytime, anywhere. I am the kind of person who eats ice cream when its raining outside. This is a perfect recipe for people with a sweet tooth. Enough said, let's move on to the PERFECT DATE RECIPE. Check out the eggless dates cake recipe and dates kheer recipe too. Soak the dates in 1/2 cup of warm milk. You can put the dates and milk in a microwave safe bowl and microwave it for 1 minute. Soak for 15 minutes. Soak the almonds also in hot water for 15 minutes. Take out the skin of the almonds and take out the seeds from the dates. Blend the soaked dates, almonds, banana and milk (used for soaking) in a blender/mixie. Add the 1 cup of milk (chilled milk) to this and mix well. Chop 2 dates and 2 almonds and put this into the mould. This step is optional. 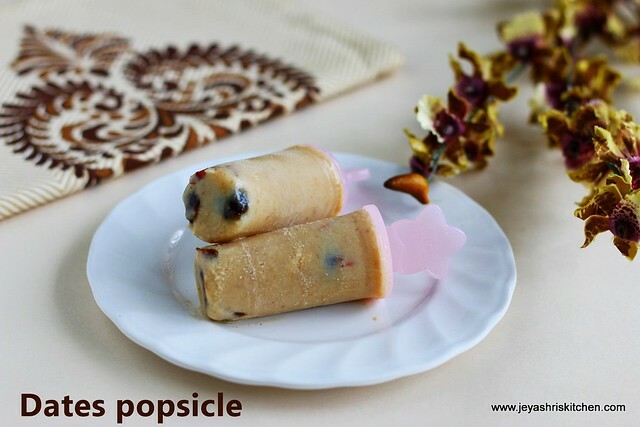 Pour the juice/mixture into your popsicle moulds. Freeze it for 6-7 hours. Once done, run this moulds into water and gently take it out from the mould. You can also have it like a milkshake without freezing it. This recipe doesn’t have sugar as the dates are already very sweet. Well written Varsha and a happy wedding anniversary to you Jeyashri from all of us. Many happy returns of this wonderful day. Varsha is doing a real good job. I think she should start a blog of her own.